STAMFORD, Conn. — October 29, 2014 — NBC Sports Group announced today that Krista Voda has signed a multi-year agreement to serve as host of NBC Sports’ upcoming NASCAR Sprint Cup and XFINITY Series pre- and post-race coverage, beginning in 2015. Her on-air duties will also include regular appearances as host of NASCAR AMERICA on NBCSN, as well as a range of assignments across NBC Sports and NBC Olympics. The announcement was made today by Sam Flood, Executive Producer, NBC Sports and NBCSN. Krista’s résumé is among the strongest in NASCAR broadcasting. When she joins NBC Sports in 2015, it will mark her 14th continuous year covering the sport on network television. She is the current host of the NASCAR Camping World Truck Series pre-race show for Fox Sports, and was the first female to ever host NASCAR’s Daytona Duels, as well as the NASCAR All-Star Race in Charlotte. She recently concluded her eighth season as a pit reporter for NASCAR Sprint Cup Series coverage on Fox and has hosted or co-hosted every NASCAR Hall of Fame Induction ceremonies, many NASCAR Awards Banquets, and several Fox studio shows. 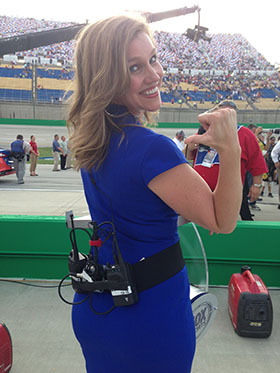 Outside of motorsports, Krista has an impressive breadth of experience, including NFL sideline reporting, and on-air contributions to numerous major sporting events, including Postseason MLB broadcasts, Bowl Championship Series coverage, The Kentucky Derby, multiple NCAA Men’s Basketball Tournaments and the PGA Championship. In addition to NASCAR’s Sprint Cup and NASCAR XFINITY Series races, NBC also obtained exclusive rights to practice and qualifying sessions for NBC’s national series events during their portion of the season, as well as rights to broadcast the NASCAR K&N Series, NASCAR Whelen Modified Tour, NASCAR Toyota (Mexico) Series, the NASCAR Hall of Fame induction ceremony and NASCAR’s season-ending banquets. Further, NBC is granted Spanish-language rights, certain video-on-demand rights and exclusive TV Everywhere rights for its NASCAR Sprint Cup Series and NASCAR XFINITY Series events.